This sturdy platform mattress foundation is designed for strength and style. 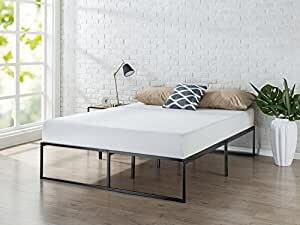 The extra strength steel framed mattress foundation by Zinus features steel slats that provide strong support for your memory foam, latex, or spring mattress. 14 inches high and easy to assemble, the frame arrives in a narrow box to make moving through hallways and upstairs easier. Another comfort innovation from Zinus.